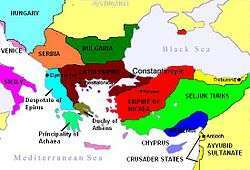 Map of the changes in borders of the Byzantine Empire. The dates represented are 476 (Fall of the Western Roman Empire; Basiliscus deposed and Zeno restored), 550 (Justinian I's western reclamations; Ostrogothic Kingdom), 717 (Leo III reign; 2nd Arab siege), 867 (Basil I reign begins), 1025 (Basil II dies; Constantine VIII reign begins), 1095 (Alexius I Comnenus requests western aid against the Seljuk Turks), 1170 (Amalric I and Manuel I alliance), 1270 (Michael VIII reign), and 1400 (Closing of the Byzantine–Ottoman Wars). The Byzantine Empire (the Eastern Roman Empire during the medieval period, after the fall of the Western Roman Empire) following the crisis of the Gothic Wars managed to re-establish itself in a golden age under the Justitian dynasty in the 6th century, and during the Early Middle Ages it continued to flourish even after the Muslim conquest of the Levant and the constant threat of Arab invasion. But in the High Middle Ages, under pressure from the Seljuk Empire, it entered a period of continuous decline. After the Battle of Manzikert (1071) it lost control of Anatolia, and while the Crusades provided a respite from the threat of Islamic expansion during the 12th century, the empire was captured by the Crusaders themselves in the Fourth Crusade in 1204. Even after Roman rule was restored in 1261, the empire was now a shadow of its former self, and after the end of the Crusades, the empire had little to set against the rise of the Ottoman Empire during the late medieval period, and was eventually destroyed with the Fall of Constantinople in 1453. The process by which the empire waned, and from when its decline can be traced, is a matter of scholarly debate. In some cases, the entire history of the Byzantine Empire has been portrayed as a protracted period of decline of the Roman Empire. This holds especially for Enlightenment era writers such as Edward Gibbon, their view colored by pro-western or anti-clerical biases, who tended to see the whole ten-century empire as merely a sad codicil to the Roman Empire of Antiquity. Late-20th-century and early-21st-century historians have instead emphasized the empire's remarkable resiliency and adaptability to change. The Byzantine-Arab Wars and the Battle of Manzikert have traditionally been considered the most significant. However, recent books by Paul Magdalino and John Birkenmeier have re-evaluated the position of the empire in the 12th century, citing the collapse under the Angeloi (1185–1204) as the most decisive turning point in the empire's fortunes. Although this view is not universally held, historians generally agree that after the Fourth Crusade in 1204, the empire was only a shadow of its former self. The death of Michael VIII in 1282 marks the last period of Byzantine success on anything more than a minor scale. From this date onwards, the empire entered its final decline. 602 - Start of the Byzantine–Sassanid War of 602–28, which exhausted the Empire's resources and contributed to major territorial losses during the Muslim conquests of the 7th century. The final decline during the Byzantine–Ottoman Wars. In the 5th – 7th century, the Eastern Roman or Byzantine Empire was a continuation of the Roman Empire. The loss of the Western territories in the 5th century led to the loss of some important cities such as Rome. The creation of the Germanic states of the Franks, Visigoths, Ostrogoths and later of the Lombards out of the rubble of the Western Roman Empire meant that in time they would seek to challenge the authority of the Eastern Roman Empire. General Flavius Belisarius under Justinian I in the early 6th century made a serious attempt to recover the western half; however his gains were short-lived and poorly planned out – resources and troops that could have been used to defeat the Persians were diverted forcing the Byzantines into tribute and diplomacy to deal with this Eastern threat. The loss of the western territories led to the Patriarch of Rome achieving greater independence from Byzantium, which no longer provided adequate protection to the Pope. Consequently, the Holy See and Byzantium would have disagreements, culminating in the schism of 1054 and the disaster of the Fourth Crusade in the 13th century. In the 7th – 9th century, Islam gave the Arabs a newfound zeal and desire to conquer. They expanded to the territories in the Levant and Egypt. The Arab invasions led to the loss of Egypt, Syria, Palestine and for a short period of time, Crete, Sicily, Cyprus and Asia Minor. Though Asia Minor was recaptured and substantial parts of Syria and Mesopotamia either taken back or subjugated, Egypt remained firmly in Arab hands as did the rest of Palestine. The loss of Egypt was a major blow to the Byzantines since the province of Aegyptus had provided much of the Empire's manufactured goods and natural resources, especially grain, ever since the times of Roman Antiquity. Conversely the Arab acquisition of Egypt gave the Ummayad and later Abassid Caliphates huge resources, meaning that the Byzantines had to direct large amounts of resources to stave off constant Arab incursions into Asia Minor and Syria. When the Fatimid Caliphate broke away from the Abassids the Byzantines were able to launch successful offensives into Syria and Palestine, due to this division amongst their enemies. In spite of its grievous losses of territory in Egypt and the Levant, the Byzantine empire successfully re-established itself against the threat of Islam under the Macedonian dynasty in the 9th and 10th century. But in the 11th century, a new threat arose as a consequence of the Turkic expansion out of Central Asia. The Seljuks, a division of the Kankalis branch of Oghuz Turks, profiting from both the breakup of the Abbasid Caliphate and the absorption of the Byzantines with internal crisis and the loss of Italy to the Normans, managed to establish themselves in Asia Minor. Following the Battle of Manzikert, the Byzantine Empire lost most of its territory in Asia Minor, and was in immediate danger of complete annihilation. It recovered following the Komnenian restoration, as Alexios I Komnenos restored relations with the Papacy, and requested aid against the Turks from Pope Urban II at the Council of Piacenza in 1095. Later that same year, the pope preached the First Crusade at the Council of Clermont. In the wake of the success of the First Crusade, the three competent Komnenian emperors, especially Manuel I Komnenos (r. 1143–1180), may have had the power to expel the outnumbered Seljuks, several factors combined to ensure that they never did so. Alexios was unable to derive much of the expected benefit from the Crusade, though it did at least help him to recover Nicaea and western Asia Minor. No emperor after the Komnenian period was in a position to expel the Turks from Asia Minor, while the preoccupation of the Nicaean emperors with the attempt to recover Constantinople meant that resources were diverted away from Asia Minor and towards the west. The result was a weakening of the Byzantine defenses in the region, which, when combined with insufficient resources and incompetent leadership, led to the complete loss of all the empire's Asian territory to the Turks by 1338. Map showing the partition of the empire following the Fourth Crusade, c. 1204. The overall outcome of the Crusades left the Empire permanently weakened. Though the Crusades assisted Byzantium in driving back some of the Turks, they went far beyond the military assistance envisaged by Alexios I. Instead of following the strategic necessities of the war against the Turks, the Crusaders were focussed on the quest of re-conquering Jerusalem, and instead of returning territory to Byzantium, the Crusaders established their own principalities, becoming a territorial rival to Byzantine interests in their own right. This was true already during the Third Crusade, which induced emperor Isaac II Angelos to make a secret alliance with Saladin to impede the progress of Frederick Barbarossa, but open conflict between Crusaders and Byzantium erupted in the Fourth Crusade, resulting in the Sack of Constantinople in 1204. Constantinople was now itself a Crusader state, known as the Latin Empire in historiography, but from the Greek perspective as Frankokratia or "rule of the Franks". Vestiges of imperial power were preserved in minor principalities, the Nicaean Empire, Trebizond and Epirus. Much of the Nicaean Emperors' efforts now went into combating the Latins, and even after Constantinople was returned to Greek rule under the Palaiologoi in 1261, the Empire exerted much of its efforts into defeating its Latin neighbours, contributing to the eventual failure of the Crusades by 1291. Throughout the 14th and 15th centuries the Empire suffered from many natural disasters, invasions and several coups. A series of societal infighting also weakened the Byzantine Empire's military power. There were two major civil wars during the late Byzantine Empire, one in 1321 another in 1341. These civil wars also severely diminished the Byzantines' military capabilities. The civil war of 1321–1328 was led by a grandson of the Byzantine emperor Andronikos II who was supported by Byzantine Magnates who often clashed with the centralized authority of Byzantium. The Byzantine civil war of 1321–1328 was inconclusive and ended with Andronikos III being made co-emperor with his grandfather. This civil war allowed the Turks to make notable gains in Anatolia and set up their capital in Bursa 100 kilometers from Constantinople the Byzantine's capital. After the initial conflict Andronikos III dethroned his grandfather and became emperor. Following the death of Andronikos III in 1341, another civil war broke out which was to continue until 1347. When Andronikos III died he left his six-year-old son under the regency of Anne of Savoy. The de facto leader of the empire, John Cantacuzenus, who was not only a close associate of the deceased emperor but an extremely wealthy landowner, wanted to become regent. However, things did not go his way and he was declared emperor in Thrace. This conflict had elements of class warfare, in that the rich supported Cantacuzenus while the poorer folk supported the empress regent. The civil war of 1341–1347 saw exploitation of the Byzantine Empire by the Serbs, whose ruler took advantage of the chaos to proclaim himself emperor of the Serbs and Greeks. The Serbian king Stefan Uroš IV Dušan made significant territorial gains in Byzantine Macedonia in 1345 and conquered large swathes of Thessaly and Epirus in 1348. Although Dusan would die along with his dream of a Serbian Greek empire in 1355, Byzantium would still face a powerful Turkish state across the Sea of Marmara. Luckily for Cantacuzenus, he conquered Constantinople in 1347 and ended the civil war afterwards. In order to secure his authority during the civil war, Cantacuzenus hired Turkish mercenaries. Although these mercenaries were of some use, in 1352 they seized Gallipoli from the Byzantines. Although in 1354 the rogue mercenaries were defeated by western crusaders, Turkish armies would eventually control many of the Byzantine Empire's once-held territories. These two monumental civil wars severely diminished the Byzantine Empire's military strength and allowed its opportunistic enemies to make substantial gains into Byzantine territory. The disintegration of the Seljuk Turks led to the rise of the Ottoman Turks. Their first important leader was Osman I Bey, who attracted Ghazi warriors and carved out a domain in north-western Asia Minor. Attempts by the Byzantine Emperors to drive back the Ottomans were unsuccessful, and ceased in 1329 with the Battle of Pelekanon. Following a number of civil disputes in the Byzantine Empire, the Ottomans subjugated the Byzantines as vassals in the late 14th century and attempts to relieve this vassal status culminated in the Fall of Constantinople in 1453. The Byzantine Empire's survival depended upon its administration and the logistics that enabled it to run the Empire. Though considered complex, its system was one more advanced than those practised by the Frankish Kingdoms in the West and one modelled by the Islamic Powers of the East. As the Empire evolved into an increasingly smaller and defensive state, the governing of the state changed as well. However, by the 14th century the burdens of running an Empire surrounded by many enemies became too much of a strain on Byzantium's increasingly smaller resources. By c. 1350's, the Byzantines lost Thrace to the Ottomans; thereafter Constantinople became the government's primary administrative region. The Byzantine Empire experienced numerous civil wars. The defeats in the 7th and 12th centuries to the Arabs and Turks respectively speaking were in no small part assisted by numerous internal conflicts. The situation became worse later in the 14th and 15th centuries where Byzantine Emperors were forced to fight their own grandchildren/children, as in the cases of Andronikus II and Andronikus III. The Military of the Byzantine Empire was often smaller than that of its opponents and thus relied more upon strategy rather than brute strength to achieve success. This was in part achieved by the logistics of the Byzantine administration which allowed it to utilize their troops as efficiently as possible. Taxes on the peasantry were collected at times of need so as to raise the supplies needed at the time. However, this bureaucratic system was exploited by the social elite  whose increasing power challenged that of the Emperor. Whilst the Theme system worked well to provide efficient military service, it led to the decentralization of power leading to disastrous civil conflicts in the 11th century. Furthermore, as the taxation system became ever more of a burden on the peasantry, the lower classes of the Empire began to resent the state. This contributed to the loss of Asia Minor in the 11th and 14th centuries owing to the arrival of the Turks. Another major factor in the decline of the Byzantine empire may have been the disintegration of its traditional military system, the 'theme' system. Under this arrangement, the empire was divided into several regions which contributed locally raised troops to the imperial armies. The system provided an effective means of cheaply mobilizing large numbers of men, and the result was a comparatively large and powerful force – the army of the theme of Thrakesion alone had provided about 9,600 men in the period 902–936, for example. However, the demise of the system made the organization of the Byzantine armies less self-sufficient. The Byzantine military did not immediately collapse following the disappearance of the theme system. In the 12th century, the Komnenian dynasty re-established an effective military force. Manuel I Komnenos, for example, was able to muster an army of over 40,000 men. This was sufficient to ensure the empire's continued status as a great power for the duration of the Komnenian period. However, the Komnenoi never provided for a future that saw their decisive leadership replaced by incompetence. After the deposition of Andronikos I Komnenos in 1185, the dynasty of the Angeloi oversaw a period of military decline. From 1185 onwards, Byzantine emperors found it increasingly difficult to muster and pay for sufficient military forces, while the failure of their efforts to sustain their empire exposed the limitations of the entire Byzantine military system, dependent as it was on competent personal direction from the emperor. The culmination of the empire's military disintegration under the Angeloi was reached on 13 April 1204, when the armies of the Fourth Crusade sacked Constantinople and dismantled the Byzantine Empire. Despite the restoration under the Palaiologoi, Byzantium was never again a great power on the scale of the past. By the 13th century, the imperial army numbered a mere 6,000 men, while the empire's territories had been reduced to little more than the lands immediately surrounding the Aegean sea. Thus, it is possible to argue that the demise of the theme system was one of the most significant factors in the decline of the Byzantine empire. As one of the main institutional strengths of the Byzantine state, the theme system was never replaced by a viable long-term alternative. This left the empire lacking in underlying structural strengths. The result was an empire that depended more than ever before on the strengths of each individual emperor or dynasty. The collapse of imperial power and authority after 1185 revealed the inadequacy of this approach. ↑ Herrin, Judith (2007). Byzantium, the Surprising Life of a Medieval Empire. Princeton University Press (Princeton & Oxford). ↑ Runciman, Steven (1970). The Last Byzantine Renaissance. Cambridge University Press (Cambridge). ↑ Runciman, Steven (1958). The Sicilian Vespers: A History of the Mediterranean World in the Later Thirteenth Century. Pelican Publishing (London). 1 2 Runciman, Fall, 2. ↑ Robert Browning, The Byzantine Empire (Washington D. C. :The Catholic U of America P, 1992), 234. ↑ Robert Browning, The Byzantine Empire (Washington D. C. :The Catholic U of America P, 1992), 235. ↑ Robert Browning The Byzantine Empire (Washington D. C. :The Catholic U of America P, 1992), 236. ↑ Robert Browning, The Byzantine Empire (Washington D. C. :The Catholic U of America P, 1992), 240. 1 2 Robert Browning, The Byzantine Empire (Washington D. C. :The Catholic U of America P, 1992), 241. ↑ Robert Browning, The Byzantine Empire (Washington D. C. :The Catholic U of America P, 1992), 182. ↑ Robert Browning, The Byzantine Empire (Washington D. C. :The Catholic U of America P, 1992), 242. ↑ Haldon, John. Byzantium at War 600 – 1453. New York: Osprey, 2000. Alan Harvey, "Economic expansion in the Byzantine empire, 900–1200"
John Haldon, "The Byzantine Wars"
Runciman, Steven. The Fall of Constantinople 1453. Cambridge: Cambridge University Press, 1965. Vryonis, Speros. The Decline of Medieval Hellenism in Asia Minor and the Process of Islamization from the Eleventh through the Fifteenth Century. Berkeley: University of California Press, 1971.